I love Chipotle and I love FREE stuff. If you are like me then you will go bonkers over this incredible Chipotle Burrito Hack! H/t to DYLAN GROSZ of ApartmentList.com! 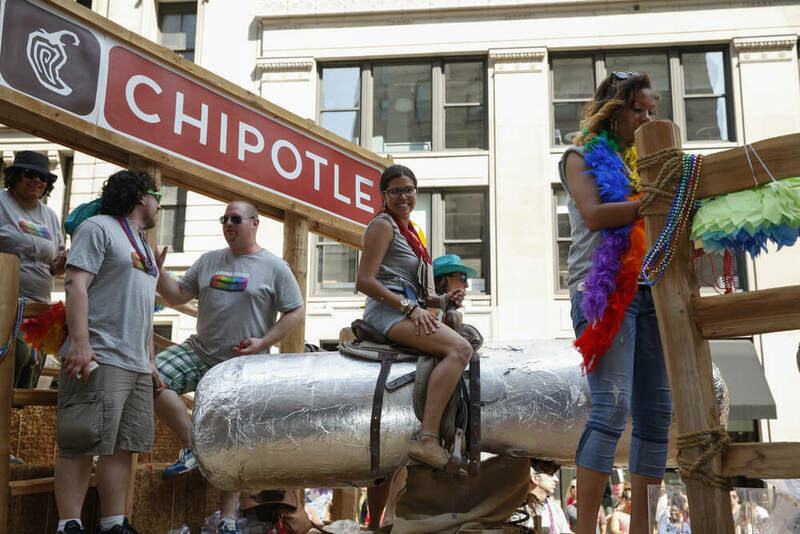 It’s basically a universal truth that the only thing better than Chipotle is…more Chipotle. I’m no religious scholar, but I’m pretty sure heaven is just one big Chipotle restaurant where the guac and chips are ALWAYS free and hell is just some Taco Bell. So when one of my co-workers at Apartment List brought up the question of how to hack Chipotle to get the most burrito for your buck, I was intrigued. If ever there was a noble intern task, this was obviously it. Through a lot of burrito research and even more company write-offs and office burrito donations, I’ve discovered these 6 tips that can increase the size of your burrito by 86% without spending any more money. You’re welcome, world. Please send the Nobel Prize to my mom’s house. So I took my geeky love of data and my black hole of a belly to Chipotle for several days and ordered 5 burritos each day (35 burritos total), then returned to the Apartment List office to meticulously separate out and weigh the ingredients. Finally, I combined all the best methods to confirm the total burrito size increase. Additional methodology footnotes are below, but for now – on to the meat of the experiment (pun intended). This method of calling in tortilla reinforcements was initially introduced by Chipotle to save burritos that busted open their first tortilla, but Chipotle sometimes lets you ask for a double wrap for free, which adds another 4.25 ounce tortilla to your burrito (ask for the tortillas at the end, when the staff just wants you to go away). Congratulations, your burrito just became 25% bigger. Ordering tortillas on the side and wrapping it yourself may be a daunting task for some, but if you value the time it takes you to wrap the burrito at $0 per hour (hey, burritos are worth your time), then you should add this method to your burrito maximization arsenal. The next time your server asks if you want white or brown rice, request both types – you’ll get almost 93% more rice, at no extra cost. This carbo-loading method increases the overall weight of the burrito by 23%. As an ancient American proverb puts it: more burrito, more food, more happiness. Just like rice, there are two different types of beans we can choose from: black and pinto. If you really want to maximize burrito weight, asking for both kinds gets you 92% more beans (another note: we aren’t responsible for the gas you’ll be having afterwards). With this method, you get a 16% burrito weight increase. In theory, asking for half chicken, half steak should yield one full serving, but our tests showed that you actually get 54% more meat – basically 3/4 scoop of each. This increase in meat grows the burrito’s weight by around 9%. You must note, however, that you’ll be charged for the more expensive of the meats, but we’ve put the many finance and accounting degrees here at Apartment List to good use and determined that it’s still financially worth it. Hidden away and rarely mentioned by servers, the fajita vegetable mix and corn salsa are free to add, and taste good to boot. These underappreciated ingredients will cure any feeling you might have that your burrito might be lacking in terms of a balanced Food Pyramid. Grilled veggies and corn not only add more color and flavor to your burrito, but they also add around 2.55 ounces, increasing the weight by about 15% (vs. the standard burrito). Not only do you have more burrito, but you can also tell your friends and family that your burrito is totally 100% healthy. Add it all together and you get…. Doing all the tricks together (you’ll have to double-wrap the burrito yourself) gets you a giant burrito that weighs almost 32 ounces, at no additional cost! You’re going to need a course to learn how to wrap all that. Don’t worry about finding one: we got you covered. There you have it. By using each of the six tricks I suggest, you may end up with a little less cheese and salsa (that comes at the end, when your bowl will already be pretty full), but you get a lot more rice, beans, and meat. My final burrito weighed 86% more than the control. Sounds like it’s time to go to Chipotle! I ordered a lot of burritos. Every day for about two weeks, I, the intern, set off to the same Chipotle around 3 P.M. to order five of the same burritos from the same shift of workers. The control burrito I compared everything to was a white rice, black beans, chicken, mild salsa, and cheese burrito. I excluded guacamole and sour cream from all burritos so that separating ingredients wouldn’t be such a hellish nightmare that would make me cry into the burrito and mess up the data. The weights I use are an average across these five burritos. Yes, that does mean I ordered 35 burritos. It’s okay, though, it was all a write off. There was no need to worry about wasting food afterwards because after I was done with the burritos I left them on the office kitchen counter and they all mysteriously disappeared within a few minutes. For some, my five burritos per day offering didn’t fully satisfy, so some coworkers and I had a contest to see who could get the biggest burrito (that we’d get to eat). The winner didn’t even use Tip #1 and got a 30.25 ounce burrito! Overall, I worked quite a few hours to gather all this data and consequently received funny looks from coworkers. It was then that it hit me how strange it was to be separating burritos at an apartment marketplace company. I have this irking feeling that my boss just didn’t know what to do with me and let me pursue my passion, but that would never happen to an intern. Though, with these astonishing results and all those dirty looks, I’d say it was totally worth it. Dylan’s incredible photo documentation of this experiment can be found here. To see the differences he found is amazing and there are a few cool info graphics, too. Enjoy! Previous Mountain Lion Stand Off With Hiker!